Really nice hostel with a nice atmosphere! The staff is super friendly and very knowledgeable about the things you can do. We arrived early on the first day and they let us have breakfast for free :) and they have really good coffee! I stayed for one week at Pisko and Soul and really enjoyed my time here. 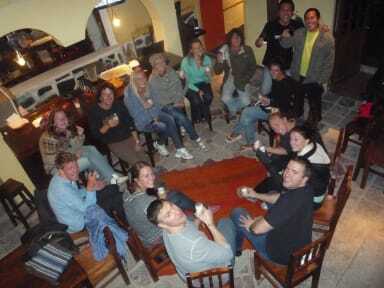 The hostel is located in the middle of San Blas, directly between lots of sweet Cafés and little shops. It's easy to explore the city by foot from here. The atmosphere in the hostel is really warm. You can connect with other traveller's easily but you can also can have time for you. The owner of the hostel is really relaxed and always help you if you have any questions. I also enjoyed the breakfast! Super schöne Lage in San Blas. Frühstück ist gut, allerdings gibt es keine Küche. Very nice location and nice staff. They took good care of our belongings while we were gone and helped us with everything we needed. The breakfast is really good with everything from eggs to cereals, bread, etc. There is also an area to hang out on sofas which is nice. I really liked this hostel. There is no shishi and glitter but everything you need like functioning wifi, hot showers and heaters in every room. Gustavo and the team are friendly and always willing to help. A nice place to rest after an exciting and tiring day in Cusco and its surroundings. Thanks guys! Wir waren nur eine Nacht hier aber die Betten waren sehr bequem. Allerdings hatten wir einen 4er Dorm gebucht und haben in einem 6er Dorm geschlafen. Leider gibt es keine Küche nur eine Mikrowelle. Frühstück war sehr lecker! The hostel is good located. The atmosphere is quiet slow because you don’t really see or meet other people, so not the best place to get to know other travelers. we arrived at 7.30am and nobody was there, even though they have a 24 hours reception. The first private room we had was next to the breakfast area, reception, entrance and street, which doesnt make sense in my opinion but we asked to change the room and that was no problem. The staff helped as much as they could with questions.